Morning Glory For Hummingbirds, Ipomoea. 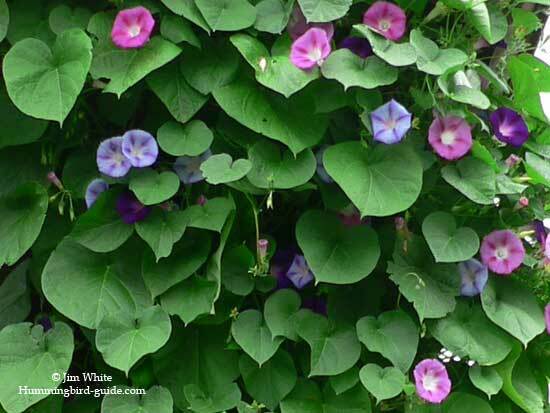 How to Plant Morning Glories. Morning Glory for hummingbirds is one of the best hummingbird flowers. I can still hear my mother’s gentle voice waking me up for grade school with these words............“Good morning glory”, she would say, using an expression that originated from the unique tendency of these flowers to curl up in the heat of the day (appearing asleep). They would awake and open up again in the early morning. I’ve loved these flowers since childhood and don’t mind that they are often referred to as old fashioned. The hummingbirds don’t mind either, as I see them regularly frequenting these colorful blooms that I grow on a trellis in front my garden and on a corner of my house. These flowers, also called Ipomoea, are tubular in shape, just perfect for hummingbirds to easily access the nectar. 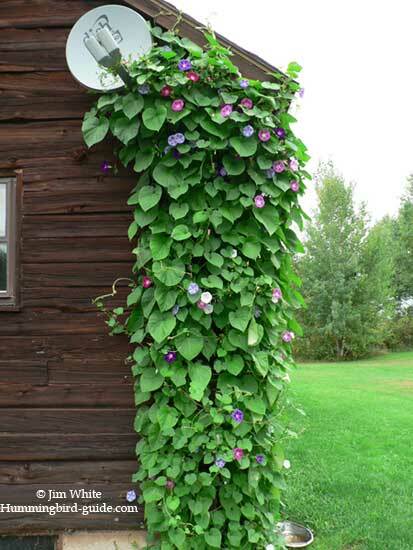 This vine couldn’t be easier to grow. In our cold climate, we generally do not grow annuals but these flowers are an exception. They grow rapidly, covering our arbor by mid summer. In a milder climate, you can and your hummingbirds can, enjoy them even longer. Another option that we do yearly: In the Fall when the flowers have all gone by and the plant is actually dead and dried up, we pick the seed pods from the vine and save them for the following Spring. We have never purchased seeds since our first planting! Soak seeds in warm water for 24 hours. This speeds up the germination. Prepare the soil by loosening. Well-drained soil is best. Plant after the last frost. Provide a trellis, wall or other support for these lovely flowers that can grow up to 20 feet. 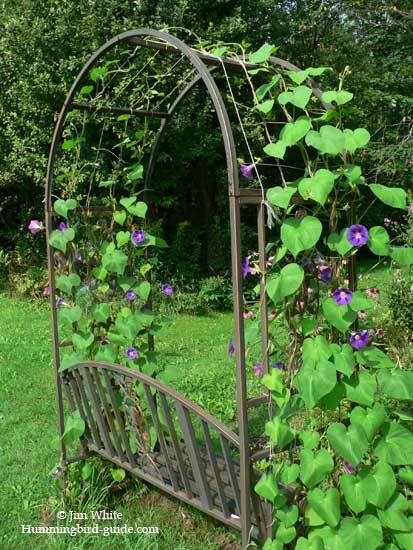 There are so many lovely trellises available today and they can add beauty to you garden. All I am left to say now is Good Morning Glory! Hummingbird Attracting Flowers to Buy!